Loyens & Loeff is an internationally based independent full-service law firm having a 100-year track record of international (corporate) tax advisory services with top (international) tax specialists and corporate lawyers, regulatory lawyers and civil-law notaries. Our tax experts have extensive experience in international taxation in a broad sense, which is more extensive than just the taxation in our four home markets (including EU and OECD tax rules). They translate the developments into their impact on clients' business and are focused on identifying tailor-made solutions. 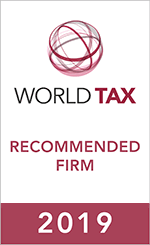 Our international relations with other acknowledged, independent tax advice and law firms provide for fast and efficient access to high-quality tax or legal advice in countries where we have no office.